That Curly is a clever piggy. Not only is he now Guaranteed Irish, he's also offering one Irish brand a €25K campaign, throwing the full reach and expertise of Pigsback.com behind it. And here's me pimping it. In-joke aside, this is a big chance for charities, events, start-ups to get their brand out there for free with the resources of a marketing company operating in the Irish market since 2000. 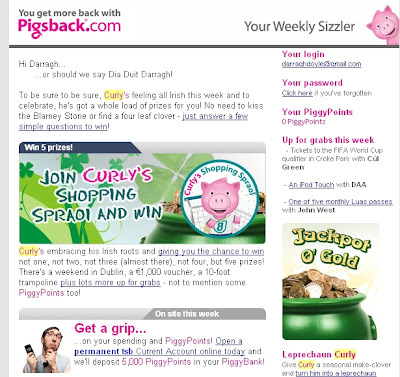 Basically Pigsback is a loyalty site with offers and competitions for the people who sign up to the site who are rewarded for giving details and opting to get targeted newsletters and surveys based on their location interests. It means they have unparalleled "targeting based on who-you-are" capability. Given the volume of emails that Pigsback send any brand getting (pardon the pun) onto the site is sure to get attention and awareness, if not interaction. It is, as I said, a great opportunity for some company to get targeted emails sent on their behalf by a company that knows what it's doing. I can certainly think of a few things I'd be planning. The terms and conditions include an entry of not more than 250 words, you must be an Irish manufactured brand or supplied service to be eligible and you will not have run a campaign on Pigsback.com before. You should check this out before March 31, 2009. Good luck - hope you do well! I might give it a go for whatwouldgodsay.ie - the disappointing number of entries despite my best efforts to promote it online etc. only 2 bloggers gave it a shout out - no mainstream media coverage at all. given all that, this might be a perfect opportunity to start all over and get it going again, and pigsback might see it as a way to prove their platform - i.e. we turned a failed effort by a blogger into a success.